The district participated in a drill on May 6 that saw emergency services respond to a simulated bus crash. Mt. Laurel Schools Superintendent George Rafferty at this week’s board of education meeting reviewed the district’s participation in a township-wide drill on Saturday, May 6, that saw the district and Mt. Laurel’s emergency services respond to a simulated bus crash. Students, staff and officials worked with Mt. Laurel’s police and fire departments and Office of Emergency Management to simulate a motor vehicle accident involving a Mt. Laurel school bus filled with students on their way to Harrington Middle School. Rafferty said dozens of middle school students played the part of victims and casualties as emergency responders arrived on the scene and began to respond to the incident. During that time, the district also tested its communication with staff, parents and other officials by releasing messages notifying individuals of the accident and providing updates on how a second bus had been provided to bring students from the accident to Harrington, while roads leading to the scene of the accident were closed. Parents and students’ emergency contacts were also instructed to bring proper identification and travel to the back of Harrington where a reunification center had been established. 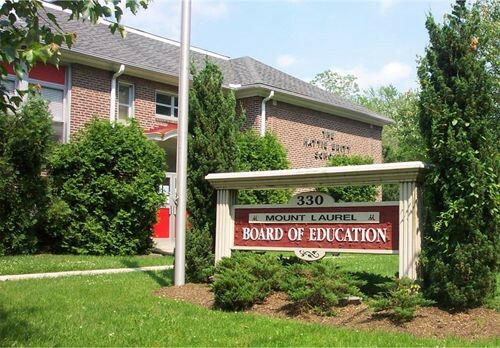 Rafferty said he wanted to let the board and members of the public know the district appreciated the work of the township’s emergency and community first responders who staged and planned the drill over the course of several months. “The agencies worked very well together, and like I said, we were very appreciative to be a part of it,” Rafferty said. With nearly 90 participants from the district involved, Rafferty said the district had a good opportunity to review and fine tune its policies moving forward as they related to emergency management. “We were particularly interested in seeing how we could improve in areas of communication with our parents, with our staff and also working with multiple agencies in Mt. Laurel,” Rafferty said. While Rafferty described the day as an intensive situation for students and staff, Rafferty said he believed all participants had come away with “a lot of things to reflect on” and having learned a great deal of information. “We hope it will all make us stronger and better in terms of working together as a community,” Rafferty said. The board also honored Larchmont teacher Angela Duke, Parkway teacher Dennis Jakubowski and Harrington teacher Alan Smith who retired after last year’s staff recognition ceremony. In addition to the retirements, the board honored staff members who were celebrating 25 years of service to the district this year, including Countyside counselor Claudia Horner, Larchmont secretary Rosemary Liddie, buildings and grounds supervisor Harry Meeker, Hillside teacher Nancy Mellin, Harrington teacher Sandra Poulton, Fleetwood teacher Karen Saybolt and Larchmont nurse Eileen Valerio.